I was excited at the prospect of visiting Ashmore Reef again. I expected to see lots of new birds. The first time I visited was in autumn, and I only saw three lifers. This time, in spring, I expected to do much better. If I'd visited in 2015, I'd certainly have seen ten new birds and might have managed eleven. Before I set out, I studied all the reports from previous trips and noted all the birds I might hope to see. I compiled a list of the most likely. I included only birds which had been seen multiple times, and that had been seen in 2015. I was trying to be realistic, and not create unreasonable expectations. There were eight birds on my list: Swinhoe's Storm-Petrel; Matsudaira's Storm-Petrel; Collared Kingfisher; Grey Wagtail; Middendorff's Grasshopper Warbler; Arctic Warbler; Asian Brown Flycatcher; and Island Monarch. Silly me! I should know better at my age! Of the birds on my list, I managed only two: the first and last. I also saw (thanks to Colin Rogers, who found it) an Edible-nest Swiftlet, so I came home with exactly the same number of lifers as last time. Just three. Earlier, I had hoped to add Leach's Storm-Petrel to my list, but there were no recent records. In fact, now the experts were expressing doubts about all the early records. Dipping on Matsudaira's Storm-Petrel was a real disappointment. I remember when I visited Ashmore in 2014, Matsudaira's had been seen on 15 out of the previous 19 trips. When we didn't see it, I was told that was because it was autumn. If I came in spring, I would be sure to see it. Of course I know that nothing is sure in the bird world. Nevertheless, I did expect to see it. After we dipped, the theory was that we were too late. If we'd been there in October, we would have seen it. Birders are great at inventing retrospective explanations. I was also disappointed to miss out on the Collared Kingfisher and the Grey Wagtail, both of which I had thought would be relatively easy. Alas! It was not so. Ashmore Reef is hard work. It is hot. Walking is not easy. The horizon is always misty because of the extremely high humidity. And there's the issue of getting in and out of little boats. Always such a joy. And on this occasion we suffered very rough seas. I was seasick. Yes, I managed the Antarctic, and even Macquarie Island without a hint of illness, but I couldn't make it to Ashmore Reef. I'd been before. I thought it wouldn't be rough. I didn't take medication. You'd think I'd know better! In fact I was ill on the first day and the really rough seas were on the way home. Some experienced sailors said our last night was the roughest they'd ever spent at sea. Everything in my cabin that could fall down, did fall down. And then rolled across the floor. And back. All night. But by then, I'd taken medication, and I was fine. Our boat, the Reef Prince, a luxury catamaran, relieves the torture and makes Ashmore Reef bearable. Now I must face up to another visit, to try again for Matsudaira's Storm-Petrel. I think I will have to wait until they take the Reef Prince again. On Melbourne Cup Day (1 November) I flew to Broome, where I spent the night. The next morning, George Swann picked me up at 6 a.m. and took me to Entrance Point, where a tinny took us to the Reef Prince. We were welcomed aboard and instructed that we must drink Gaterade every day. It would be available beside the water fountain. Water on board was desalinated, so was pure and missing essential salts. We left at 8.45 and spent all day Wednesday and Thursday cruising towards Ashmore Reef and arrived after lunch on Friday. I had cramp on Thursday night and asked for Gaterade. I was informed they were running low and I should take magnesium tablets! On Friday we were eager to explore West Island, the only vegetated island on the reef, and the spot where the vagrants are found. We could see the one remaining palm tree from the boat, and when we waded ashore from the tinny, we were immediately confronted by two things: the island was incredibly dry - most of the vegetation was dead; and the ear-shattering noise, like loud static radio, of seabirds. A few steps off the beach revealed a colony of 25,000 Sooty Terns! Seabirds had nested on East Island and Middle Island, but in the past they had left West Island alone. That had changed with a vengeance. As well as Sooty Terns, there were Bridled Terns (about 100), Crested Terns (62),Black Noddies (900), Common Noddies (800), Lesser Noddies (20) and Red-footed Boobies (12). The boobies sat up high in the bushes, and the sun shone through their feet like red Christmas lanterns. No doubt more Red-footed Boobies will move in and destroy what is left of the umbrella bushes. This is only the second confirmed nesting colony of Lesser Noddies for Australia; previously they were thought to nest only on the Abrolhos. 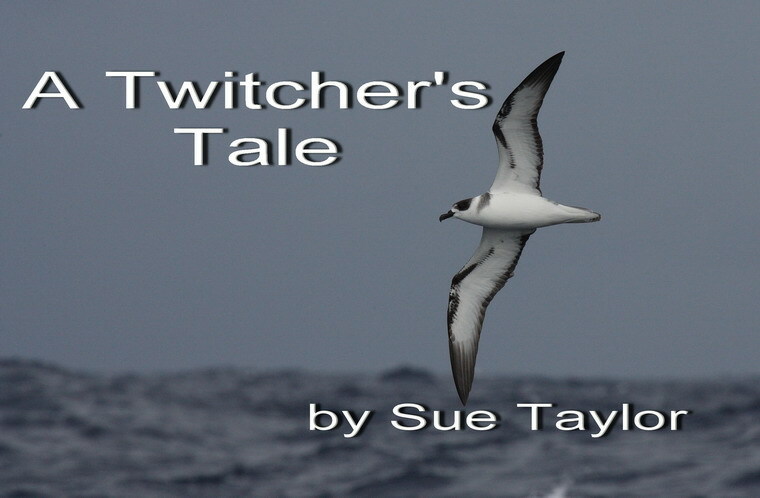 A few active burrows of Wedge-tailed Shearwaters showed that they, too, were nesting. Their chicks would have to overcome attacks by red fire ants. We saw ant trails in several places on the island, confirming that attempts to eradicate the ants had failed. We visited West Island on a total of eight occasions, each evening leaving at sunset while hermit crabs swarm towards the sea. We walk around the island twice, a total of 5 kilometres, then it's another difficult kilometre wading through shallow water back to the tinny. We saw Eurasian Tree Sparrows (just three birds) every time we visited. Also Sacred Kingfishers (which I examined closely, trying to turn them into Collared Kingfishers), although not as many as I remembered from my previous trip. Rainbow Bee-eaters were common, as were Red-tailed Tropicbirds. We saw Yellow Wagtails on most visits, as well as Horsfield's Bronze-Cuckoo. Reef Egrets were abundant, both white and dark morphs, approximately in a 70:30 ratio. We saw Nankeen Night-Herons every day, and Buff-banded Rails roosted in trees, or ran around the edge of the colony stealing eggs wherever possible. There were also waders every day: Pacific Golden Plovers, Greater Sand Plovers, Whimbrels, Red-necked Stints, Common Sandpipers and Ruddy Turnstones. We saw the Island Monarch several times and once watched him consume a large ghecko. Just one Oriental Cuckoo put in an appearance, and one Barn Swallow flew over. We did enjoy good views of two Indonesian races of our Australian friends: the Rose-crowned Fruit-Dove (which did not have a rose crown and is called the Grey-capped Fruit-Dove) and the Arafura Fantail (under some taxonomies regarded as a full species, known as the Supertramp Fantail). While we visited West Island in the early morning and late afternoon, we ventured further afield in the middle of the day. On Saturday, we visited East Island, admiring hundreds of juvenile Lesser Frigatebirds. On Sunday, we went to Middle Island and Horseshoe Cay. Last time I was here, we were not allowed to disembark on Middle Island because of the ant eradication program. This time going ashore was permitted. I don't think we saw anything we could not have seen from the tinny circumnavigating the island. Here we saw one leucistic or perhaps albino frigatebird - very pretty. On Tuesday morning, before 9, we set sail for Browse Island and arrived at 11 p.m. West Island is 23 hectares; Browse is 14. Unlike Ashmore Reef, Browse is officially part of Western Australia. On Wednesday morning, as we prepared to visit Browse, the seas were very rough. I arrived at the back of the boat to clamber onto a tinny at 10 to 5. The first tinny was leaving already. I waited for it to return, wondering if Browse would be as dry as West Island. I still had a chance of a rare bird. Or so I told myself. The captain came back for his second load, and warned anyone who was not sure-footed not to go. Two people had fallen into the sea as they tried to get off the first tinny. I was not the oldest person present, but I was perhaps the least agile. I decided not to go. I waved them goodbye, and tried very hard to hope that they had good sightings. I could see Browse Island from the boat. There was a lighthouse, but little else. It did not look exciting. And (I'm ashamed to admit) that I was pleased to see that the figures I could see through my binoculars wandering around the island did not look very excited either. Soon I was distracted by two young very healthy-looking Indonesian fishermen, paddling a dugout canoe, and attempting to board the Reef Prince. 'Hello, missus!' they greeted me cheerfully. 'I'm sick.' Sick they did not look. I told them to wait and I'd inform the crew. I'm not sure what the captain said to them (I was busy doing something essential in my cabin at the time) but I never saw them again. 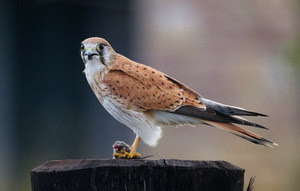 Eventually, everyone returned from Browse Island to report that they had seen a pair of Chinese Sparrowhawks, and that, because of the presence of the raptors, there was nothing else. I heaved a sigh of relief, having seen Chinese Sparrowhawks on Cocos Island in 2014. Wednesday was a very rough, sleepless night, and on Thursday we arrived back at Broome around 1.30. Given how much I hate small boats and hot weather, I enjoyed the trip very much. I was, of course, very disappointed to achieve only three lifers, but it was fascinating to be so close to nesting seabirds. Whichever way you look at it, Ashmore Reef is a big adventure.